Just remind that for costume making I will be following the tudor costume page fairly slavishly the tudor tailor book and nearer the time costume elves [!] for the difficult bits I am currently not a re-enactor, but have visited Kentwell and we are really keen as a family to join the tudors. I plan to make a shift and petticoat for each of us girls, a shift for DH by Xmas, and 2 shifts each before the first open day in feb [ie majority of linens, at my own risk as may well not be accepted] this is because there is a huge amount of sewing to be done, and i think if you are any more than 2, to try and fit it all in after acceptance is really a tall order and hard work. This means that the steps detailed here are not originating from my brain, but the tudor costume makers, though some of the mistakes and how to avoid unfortunately did :blush: . The tudor costume page has unfortunately got some non-working links, and since it was last updated a fair while ago there are a few non-completed bits. This wasn’t a problem for petticoates though. Nothing detailed here seems particularly at odds with costume notes from a prev year. So having made that decision for SB, I decided to do the version at the bottom of the tudor costume page which allows for pregnancy etc. obviously at 10 this isn’t n issue [phew!] but did want to factor in some growth. i did actually measure this a lot more carefully! 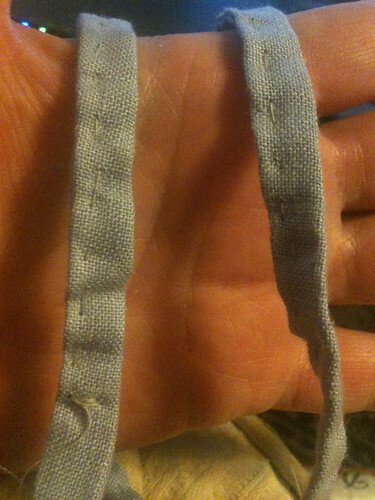 I have 2 waistband halves: the front and the back. 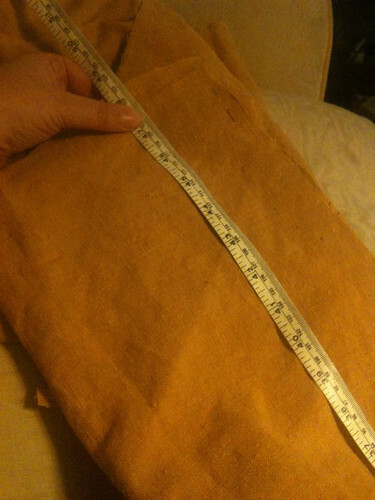 each was measured out at 14 inches by 4 inches, with the plan to have a 12 inch by 1 inch band at the end. however, having prepared one, I thought that I would make the other so it was 13 by 1 inch to give a bit more breathing room after putting the 2 12 inch ones around sb. 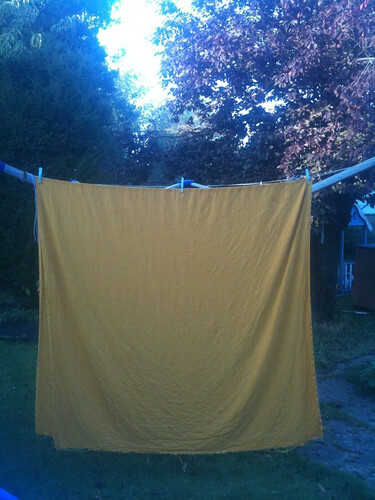 SInce i had included plenty of hem allowance in the cutting, this was very easy. 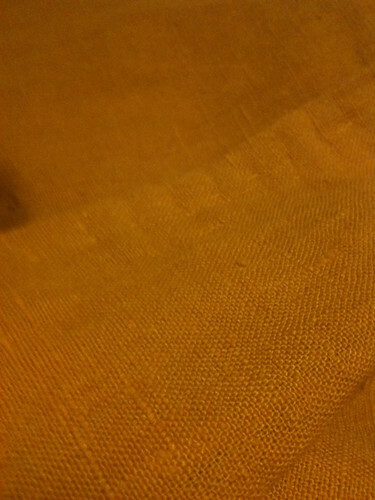 [the costume notes suggest making your waistband 5'' longer, i am not sure why? 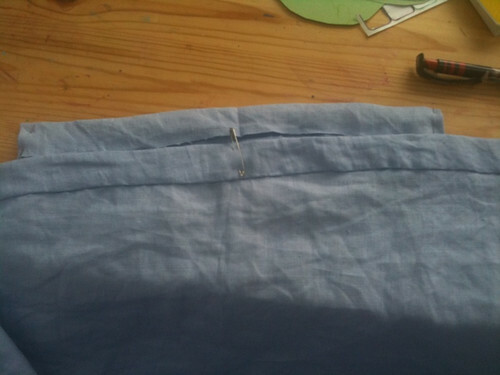 or is it to waistband the placket? I didn't anyway, and it seems to have worked nicely. I did all the folds as in the tudor costume page, and then had a crisis and couldn't overcome my natural disinclination to use an iron. 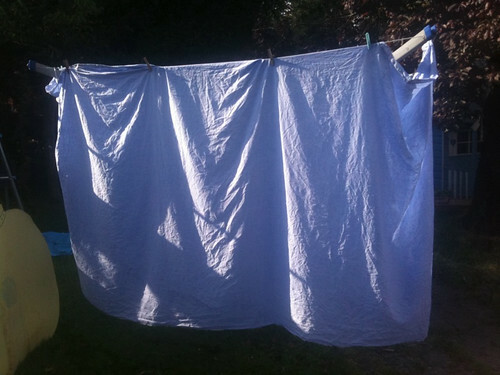 Linen seems to fold well anyway. I did, however, mark the pleats with pen as that seemed very sensible. Due to the voluminous amount of material [hence suggesting a x3 multiplier is more than adequate, and in truth a max of 2m all round] i spaced the pleats at 2cm. You can see in the picture above I safety pinned for reference the centre of my waistband and the centre of the skirt together before starting pinning so all was even. 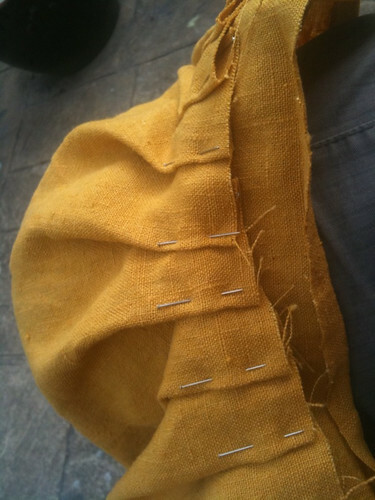 I had knife pleats going away from a central point and each pleat went back to the previous one before going ahead the next 2cm ie 4cm forwards and 2cm back, 4 cm forwards etc to space at 2cm. this left me with 3inches of free material on each side of the front 12 inch waistband, which are the plackets for the extendible nature of the petticoate. For the rear 13 inch waistband I did some minor bodging so that it fitted. 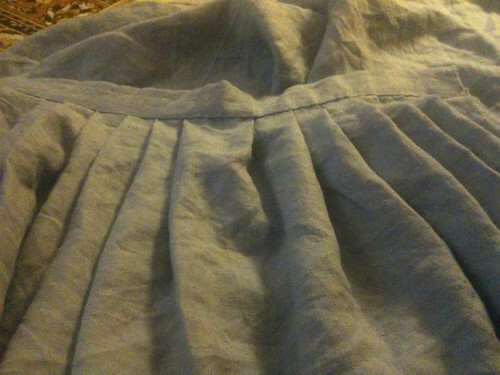 Tudor petticoats at this time have a central unpleated section at the front and knife pleat all the way around to the back, where they meet as a box pleat. 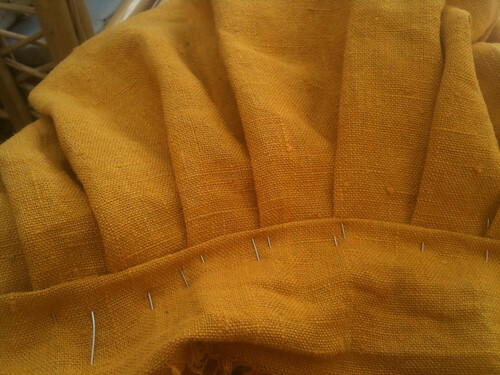 When I pinned these down, I pinned both the forward turn of the pleat and also the backwards return. please have all your pinheads to the upper rather than heads down. It will make it a lot easier to remove them after stitching! I have to say that here I am not entirely sure I have followed instructions. 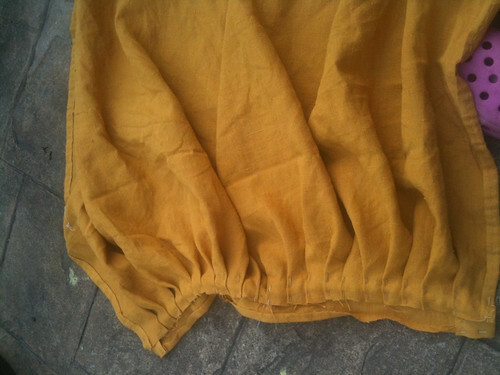 i have hemmed the waistband onto the pleats on the outside as I think it suggests, and then decided just to hem the other side might be a bit weak, especially for a child who will run and trip up etc. SO after hemming the good side, on turning back over I did a running stitch between the pleats and the fold up of the waistband, so invisible from the outside, but hopefully a bit of extra strength. 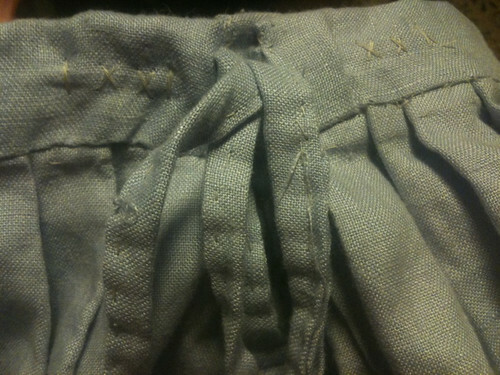 I removed all the pins – including those lost in the folds because their heads were down – ouch – and hemmed the inside view waistband to pleats. It does look v neat and good [for me] and I am pleased. 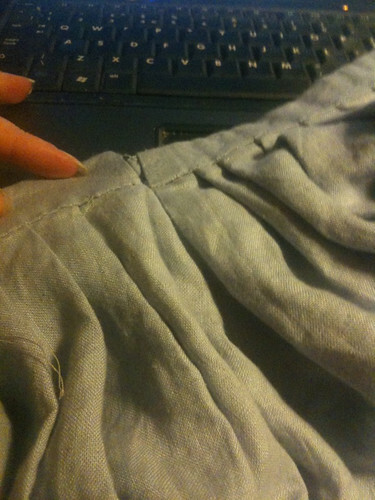 The waistband is chunky though, due to the unfortuate hemming of all sides thing. Might not be a bad thing though, as won’t ruckle up so much. ou cans see the thickness and the sewing through in one of the pictures. i would have been delighted except... it is about 1.5 inches from being a snug waist fit ie that extra inch wasn't required. Ho Hum. She has a 6 month to grow before trying it on for real, so maybe will need some of that inch. The length is just right for now, as she is bound to have a couple more inches of height. I decided i would have them 1cm wide so cut 2 inches wide and the length of the waistband long. 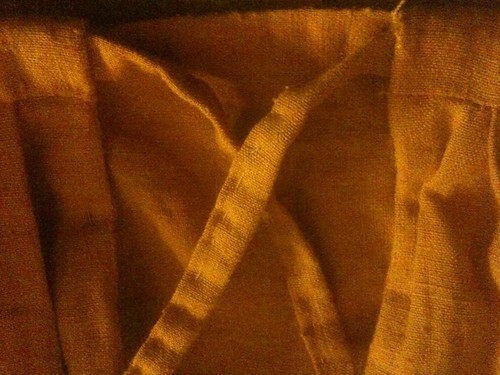 Initially I did it as per the tudor Costume, sewed inside out and attempted a pull through, it did fine till half way when my thread snapped. I decided to bail out, and did the fold as per waistband [fold each edge into the middle] and did a neat running stitch all along. I think it looks fine . I have then sewed them onto the waistband, recessed along by 3 inches, and since these stitches would be visible, decided to make them v slightly decorative. I think it looks good, will hopefully hold firm, and will scrunch up the sides perhaps 1/2 inch each side, so take most of the spare out. Very happy with the end result. SOme of the seams etc could have been neater, I have definately learnt from the process so the next should be benefitting from this. Alternativeoy, a hook and eye fastening is fine. so today i have cut the 2 main panels at the full material width of 150 being the waist and the length of 120cm. 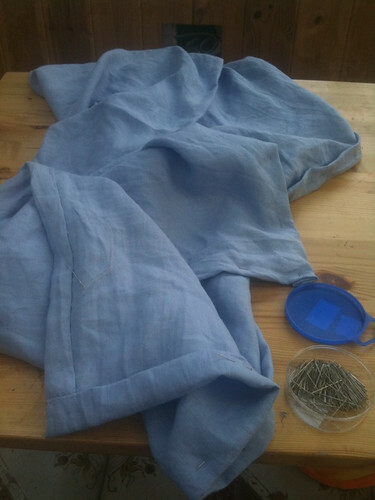 Then from the remaining material I have cut the 2 placket inserts of 20cm by 120cm – I will deal with these later . This time, perhaps due to less material and it being stiffer, my lines are far straighter and neater, and as expected it has made the whole process easier. 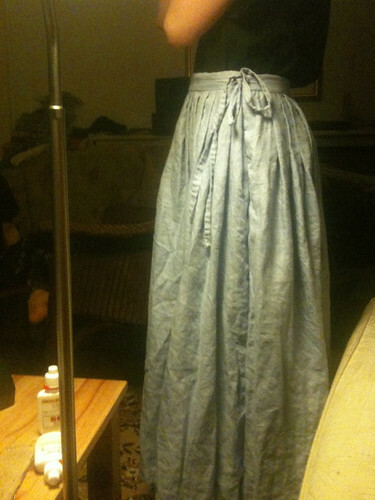 Being on my second skirt also easier as I didn’t need to reference back to the tudor costume page. 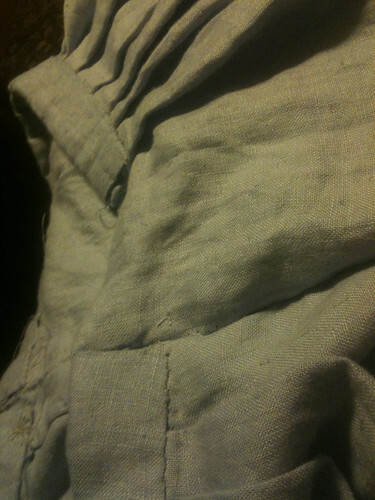 I just hemmed the sides this time, rather than mistakenly the whole lot!! I will hem the bottom at the very end of the dressing process when I have made a kirtle and have an understanding of what length to go to and then update this post! 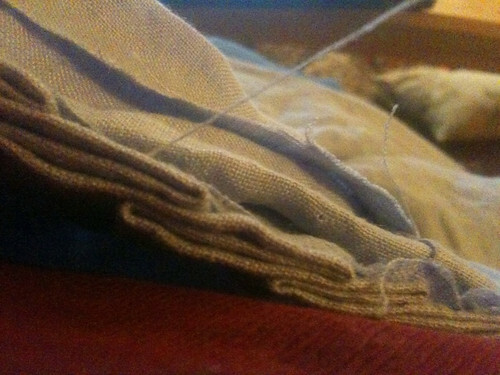 Because it has such a nice selvedge at the sides, I only turned over rather than a proper hemming – again giving me more material. I think I was overconfident here, being so happy with my rectangles and plackets. 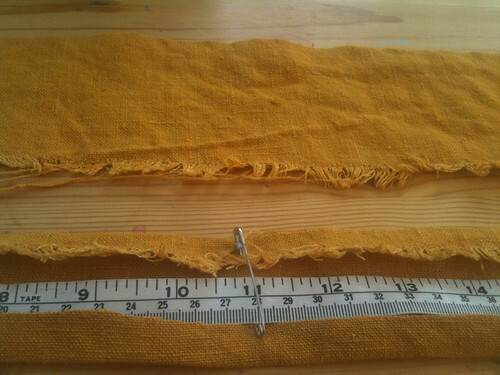 I had decided that I would like a wider waistband than the child one I had made, so ‘cut three inches instead of two’ for the depth, this was entirely wrong!! I had cut 4 for the childs one, which gave an inch waistband, so should have cut 5 to give 1.5 [or 6 if planning to double the material fully] argh!!!! 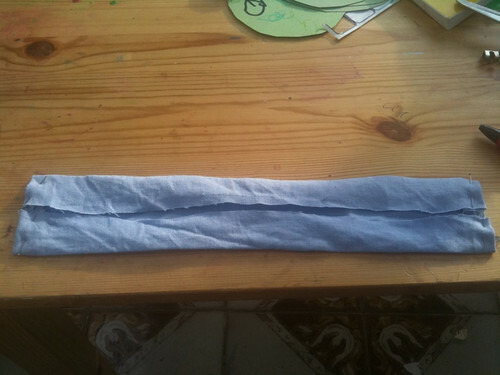 ANyway, I made it 24 inches long [i am sorry i swap between inches and cm all the time] . preparing the turnovers. I did this 2ce, one for front and one for back before realising the mistake. If I had a lot of material i would have recut. However, I know material is going to be tight, so I have stuck with it. SO doing the folds, I only turned over the edges 1/2 and inch rather than the full to the middle inch, and the ends did fold in an inch, giving me 22 inches by 2 inches, which will leave me with an inch waistband depth again. I hope the linen isn’t too unravelly! Like before I found the middle and marked it, decided to start my knife pleats 3 inches either side and then have the pleats 1 inch apart, so marked these also. I did this twice. Luckilly I realised this in the next step, because of course the back doesn’t want a 6″ smooth bit across the back, and so when I do this again, I will mark at inch steps all across the back band . I also realised this skirt would be way too big for if I shrunk, so took the waistband down to 20 inches front and back! I have decided that I enjoy pinning It might be my favourite bit. Making sure that the pleats are crisp and even . 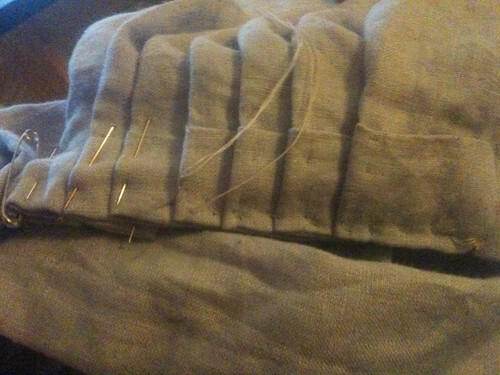 Having done the front, I turned to the other waistband and narrowly avoided my other mistake. SO I had 3 inches smooth either side and then knife pleats going away from the centre that went forward 1 inch for the first, back 3/4 inch and then forward 1.75 inches and did a tiny bit of adjustment for the last few pleats. For the back I pleated towards the side [away from the middle] and went forward an inch for the first, back for 1/2 inch and forward 1.5 with some adjustment towards the end. I then looked at them both, and although I liked the look of the front, I didn’t like the look of the back. 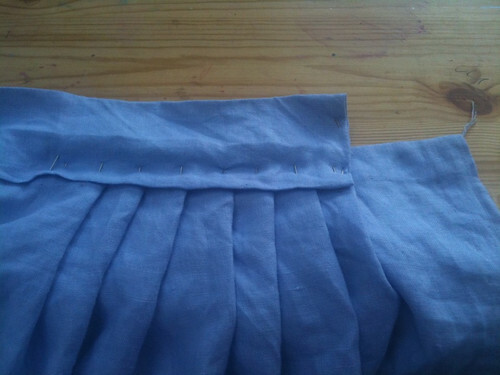 SO I took out the 1st pleat from the middle on each side and turned them, so I have a box pleat to start with. I think this looks a lot better. This is nice and easy. 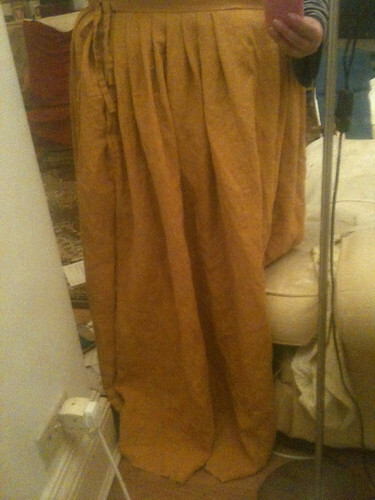 i have hemmed the waistband onto the pleats on the outside as I think the tudor costume page suggests, and then decided just to hem the other side might be a bit weak, so after hemming the good side, on turning back over I did a running stitch between the pleats and the fold up of the waistband, so invisible from the outside, but hopefully a bit of extra strength. 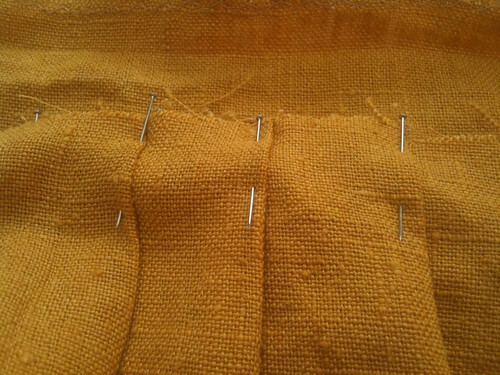 I removed all the pins – this time I had made sure all the heads of the pins were uppermost. 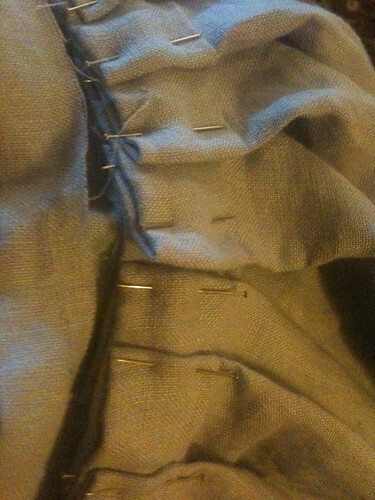 This time on folding over I have only pinned the inside view waistband to pleats. This is partly because if there is any material spare, I may consider adding a ribbon along if I can be bothered! 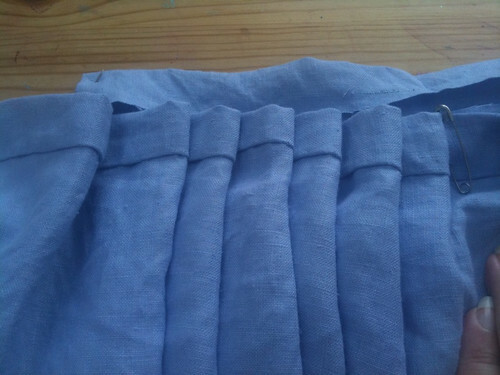 But it is also so that if i do box pleat in the placket, it can be done under the waistband and much much neater I do like how the pleats are looking. I digress. 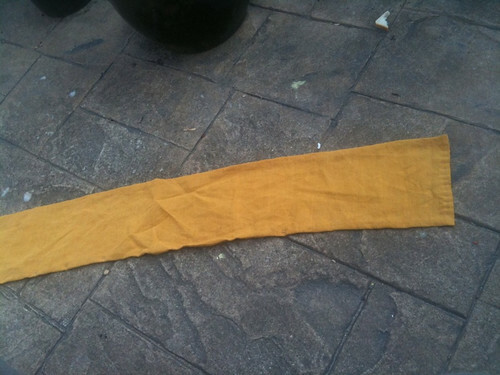 I have these 2 bits of 20cm [8 inches] by 120cm and will hem sides and top to take it to 6 inches by 120cm. 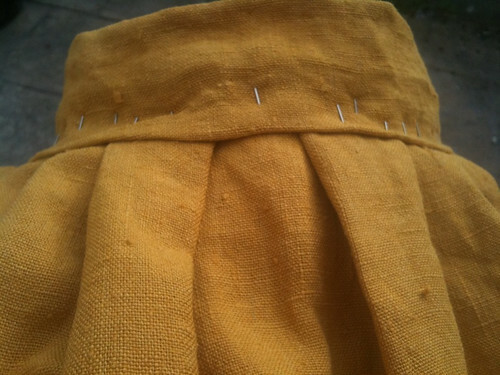 of these, and then intend to whipstitch them to the front and back to make a side panel on each side, and then consider a small pleat under the waistband on each side, giving it a box pleat appearance and 4 inches of extension from the placket on each side. This should enable it to be easy to get on and off and a varying waist size from 40-48 inch, so a 22 – 26 dress size. I have the smallest bit of material left! I have enough to make 4 linen ties of 2 inches wide and 19 inches long. These I will fold as per waistband, so the edges are folded into the middle and then the whole thing in half so raw edges buried, and then tack along.